Thought Balloons - Creating Comics One Page At A Time: Why the Klondike Gold Rush? 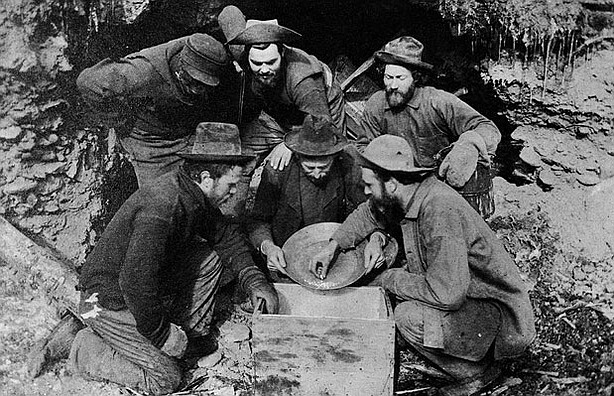 Over 130 years ago, a small family of prospectors discovered a rich vein of ore along Bonanza Creek, deep in the Yukon. News of their findings spread quickly, and before the end of the month, all of Bonanza had been claimed, as well as its tributaries. By July, almost a year later, two ships came in to Seattle bearing nearly one billion dollars (adjusted) in gold, further enticing those brave enough, foolish enough, or both, to pack up their homestead and get moving. And though an estimated 100,000 made the trip to the fabled Canadas, roughly 40,000 ever arrived, and fewer still made their fortunes. Historian Pierre Berton described the Klondike as "just far enough away to be romantic and just close enough to be accessible", which sounds an awful lot like another industry we promote here on Thought Balloons. If you're likewise inclined, grab your gear and mine along with us. Labels: Klondike Gold Rush, Why?